All Connecting Learning & Living curricula is built around youth development and educational models. This section describes these models. One of our most frequently asked questions is: "Does Connecting Learning & Living curricula align with the essential concepts and skills standards from the Iowa Core Curriculum?" Yes, the national standards identified in the content objectives and subject standards of each CLL lesson align with Essential Concepts and Skill Sets of the Iowa Core Curriculum for science, literacy, mathematics, social studies, and 21st century skills. The Iowa Core Curriculum uses the national standards as a guide to help local school districts to deliver challenging and meaningful instructional content to students. For example, many of CLL lessons teach students how to apply and understand the characteristics of living things, life cycles of plants and animals, basic needs of plants and animals and how they interact with each other and their physical environment, ways to take care of the environment, and good health habits. These primary life science concepts and skills from the Iowa Core Curriculum are also national early elementary life science standards and benchmarks. IOWA 4-H VISION A world in which youth and adults learn, grow and work together as catalysts for positive change. IOWA STATE UNIVERSITY EXTENSION MISSION ISU Extension builds partnerships and provides research-based learning opportunities to improve quality of life in Iowa. 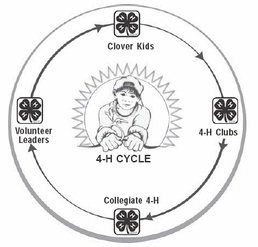 IOWA 4-H MISSION 4-H empowers youth to reach their full potential working and learning in partnership with caring adults. Dr. P.A. 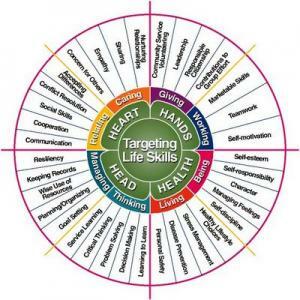 Hedricks developed the Targeting Life Skills (TLS) Model. The TLS Model is intended to be inclusive for all possible life skills. The terminology in the TLS Model is not the same as that used in any one other current list of life skills. By being generic, the model allows those developing curriculum to incorporate any specific life skill that youth programmers may wish to address using whichever terminology is descriptive of that skill. Every Growing in the Garden and Where We Live lesson focuses on activities intended to develop life skills, such as critical thinking, communication, citizenship, responsibility, respect, learning to learn, healthy lifestyle choices, and cooperation to deliver content objectives. The TLS Model aligns with Character Counts and other character building programs and the assessment strategies of the Iowa Test of Basic Skills. The questions on the Iowa Test of Basic Skills are intended to test critical thinking, problem solving, and other life skills along with content knowledge. Students participating in Growing in the Garden and Where We Live programs will improve their life skills if all the sections of a lesson are delivered as they are written. The Cooperative State research, Education and Extension Service developed the Experiential Learning Model and delivered it through Curriculum Development for Issues Programming: A National Handbook for Extension Youth Development Professionals, Washington, D.C. : CREES, 1992. This model emphasizes the importance of student involvement in the experiences or activities in each situation of the learning cycle. Students bring their own experiences and knowledge to the learning cycle. 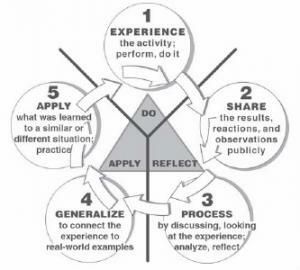 Do, Reflect and Apply, emphasizes the use of life skills to learn content objectives. Every Learner Inquires (ELI) is an Iowa science education program with a mission "to assist Iowa's area education agencies, schools and districts in building the capacity to implement an effective K-12 science education program using inquiry-based instructional strategies as outlined in the National Science Education Standards." The 5E Learning Cycle is a tool they are implementing to accomplish their mission. 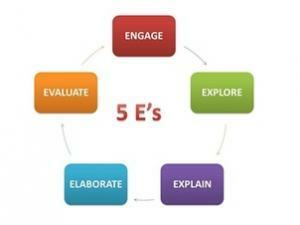 The 5E Learning Cycle is based on the Atkin Karplus learning cycle developed in the 1960s. 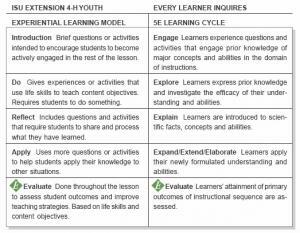 The phases Engage, Explore, Explain, Elaborate, and Evaluate, align well with the sections Introduction, Do, Reflect, Apply, and Evaluate from the Experiential Learning Model used by Iowa State University Extension, 4-H Youth Development. Every Growing in the Garden and Where We Live lesson is formatted using both these models. See the chart below for more details. Professor and author Howard Gardener, Ph.D. from Harvard University introduced a theory that people think using seven different kinds of intelligences or frames of mind. He introduced his theory in several books including: Frames of Mind: The Theory of Multiple Intelligences (Basic Books, 1983), The Unschooled Mind: How Children Think and How Schools Should Teach (Basic Books, 1991), and Multiple Intelligences: The Theory in Practice (Basic Books, 1993). Gardener has now introduced an eighth intelligence. Educators recognize the value of using these seven or eight intelligences to help students learn. It's appropriate that we use Gardener's intelligences in this garden-based curriculum. During the past 10 years of educator trainings, several teachers have brought class outlines to fill in with Growing in the Garden and Where We Live lessons. One of their school districts' criteria was that lessons must include at least two of the multiple intelligences, which we are referring to as learner types. Because Growing in the Garden and Where We Live are based on hands-on or experiential education models, there are naturally occurring opportunities to appeal to or challenge youth to use a variety of intelligences or learning styles. If you look through our lessons you will find hundreds of bolded questions intended to guide students through the learning process and to move their thinking skills to higher levels. 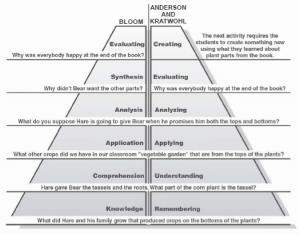 The questioning strategies are based on Bloom's Taxonomy (1956) and the revised taxonomy of the cognitive domain by Anderson and Krathwohl (2001). These taxonomies or classifications correlate well with reading standards. Our reading activities include a series of questions that reflect several levels of reading comprehension and thinking skills. In the figure above Cognitive Domain Taxonomies, the sample questions written in Bloom's and Anderson's and Krathwohl's levels of thinking skills are from Growing in the Garden, Plants Unit, Lesson 2, "Plant Parts Become Me", Reflect/Explain section, Tops and Bottoms by Janet Stevens. 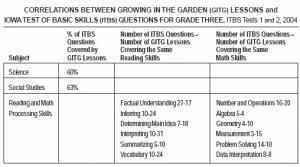 In 2004, the 2000 edition of the Growing in the Garden lessons were aligned with Iowa Test of Basic Skills (ITBS) for grades three and four. The results were exciting. GITG lessons covered more than 50 percent of the ITBS questions in Science, Social Studies, Reading Processing Skills, and Math Content and Processing Skills. Correlations were high because GITG teaches critical thinking, problem solving, reading and math skills, as well as content knowledge. GITG lessons also correlated with the context of the ITBS. Charts, graphs, reading materials, editorial cartoons, maps and other teaching strategies are found in GITG and ITBS. Do a search on "garden-based learning" and you will find many pages of research, youth development and educational program information affirming garden-based learning as a positive catalyst to help youth reach their full potential. Dozens of Iowa agriculture, environmental, food and nutrition, and education partners support Connecting Living & Learning curricula because they know that garden-based learning can be done in all educational settings, increases lifelong interests, knowledge and participation in food systems. Garden-based learning is universal because everyone eats and we all have a part in sustaining the environment to continue to grow our food and protect our water and air. Garden-based learning teaches life skills and content knowledge so students can learn to make healthy choices and how to grow food at the same time. They learn science, math, language arts, social studies, health, and the arts. Garden-based learning connects learning to living on planet earth.